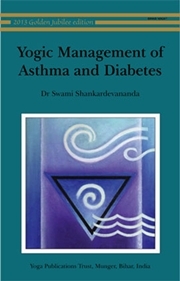 Yogic Management of Asthma and Diabetes, written by Dr Swami Shankardevananda Saraswati, under the guidance of Swami Satyananda Saraswati, explores two common disorders from a yogic perspective. The book discusses the background, nature and cause of each disease, medical and yogic treatments, diet and the yogic path to health. Yogic research into asthma and diabetes is presented, with details of clinical trials, case histories and yoga therapy camps. Yoga's holistic approach to therapy and the effectiveness of yogic methods in establishing good health are explained. Dr. Swami Shankaradevananda is a Doctor by profession and an Australian by birth. Coming under the influence of Swami Satyananda Saraswati he specialised in blending the traditional medicine and the science of yoga. Widely travelled and devoting his time to teach Yoga the learned Doctor has also written two other books "Effects of Yoga onn hypertension" and "The practices of yoga for the Digestive System".